beach days or touring around the Island. a friends summer cottage for the day. to do all the tiny stitches in this! to take photos (my hobby) to share. of china all beautifully displayed. were there to greet us on the porch! A beautiful display of teapots. quilters but they are great cooks too! sure......just my cup of tea! Oh what a delightful place. The quilt the lady is doing was amazing and such a labor of love. Thew china pieces eveyrwhere were so wonderful - not to mention all the linens and decor! What a lovely day. Carolyn - Thanks for including us in your friends' day out. Looks like a fund time was had by all. Thanks too for taking us on the tour of this lovely cottage with all of the handmade features and gorgeous dishes. What a beautiful cottage! I would want to live there all the time (well, maybe not when it was cold and snowy!). I loved seeing all the china. As a quilter, I can truly appreciate all that goes into making that gorgeous quilt. Isn't it delightful to have a friend that collect china and tea things as you do! 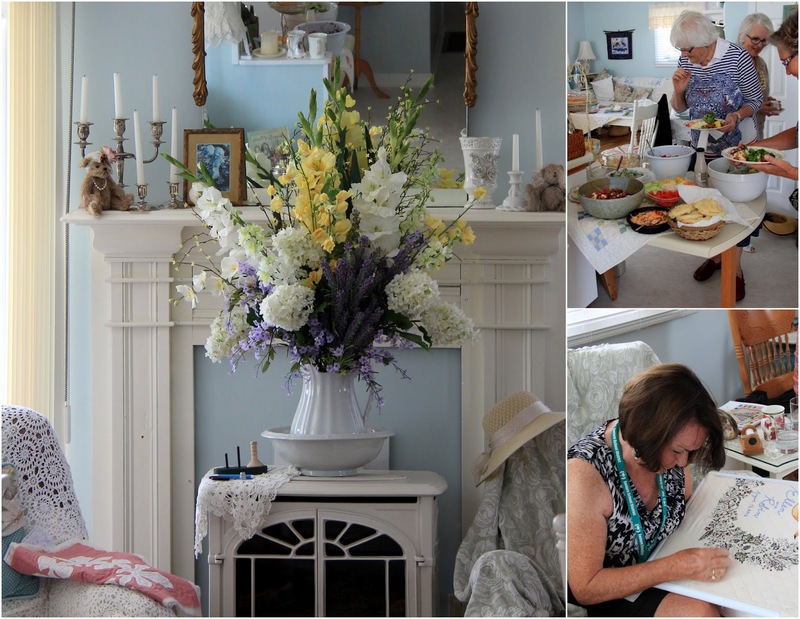 A lovely gathering and tour of the cottage. 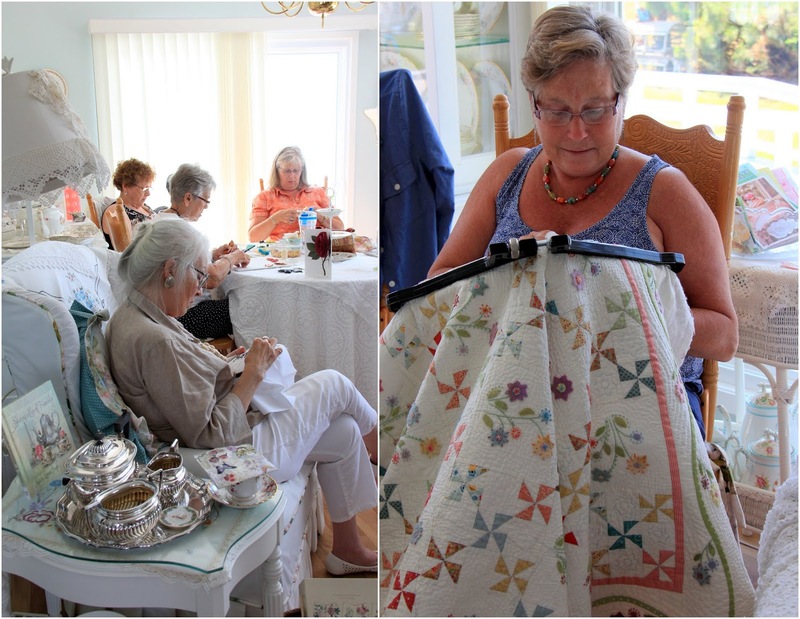 It's great to enjoy a day with friends, the quilting, chatting and delicious food in a wonderful setting with a view of the beach. Thank you for the tour in the lovely cottage, the guest rooms so very tasteful just beautiful and then all that china, love it, with the blue teapot and sugarbowl on the porch as favorites. What a charming cottage and how wonderful to spend time quilting with dear friends. And very talented quilters I might add! thank you for the fantastic Pictures!!!!! 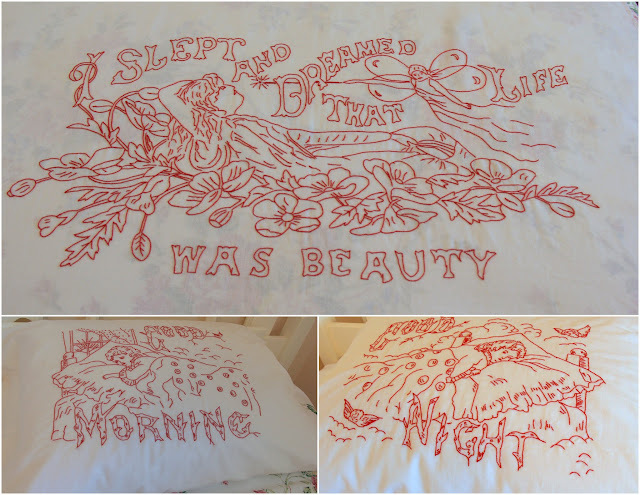 I thoroughly enjoyed this sweet cottage tour! Thank your friend for letting you share it with us! 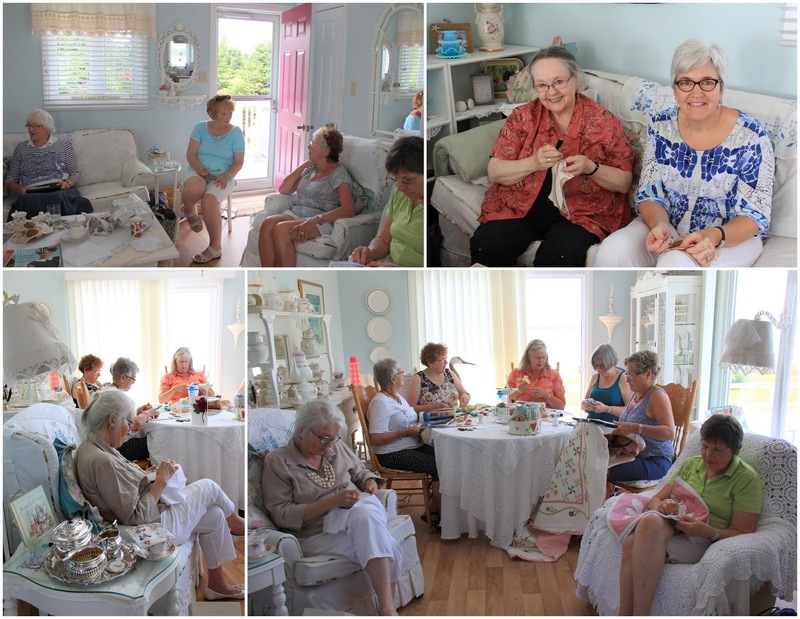 How wonderful to have such a place to go and be with friends, and partake of tea and goodies, quilting, needlepoint and comradeship. I'm so envious! to see the sea outside of the windows... oh pure joy. 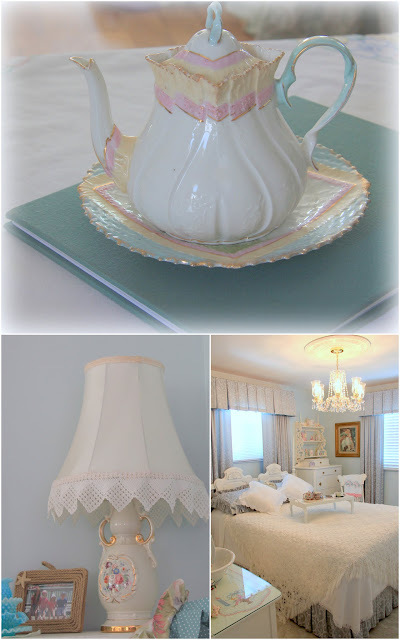 Everything she has done with the cottage is heavenly.. love the pastels and all the white and quilts and needle work. I'll have to go browse again! Your photos are beautiful of all of her china.. it is all unusual and unique and so wonderful. What a wonderful day it must have been, and hope you get to do it again soon! Hugs from Oregon. Olá lindas as suas imagens. You look as though you had a wonderful time among kindred spirits!